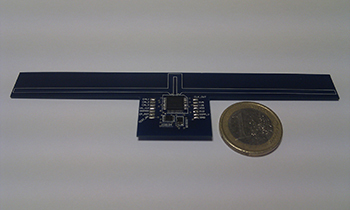 Farsens, Basque company specialized in ultra-low power digital sensors and long range RFID passive sensors, has developed innovative Gen 2 battery-less RFID sensor tags capable of measuring physical quantities and environmental conditions and transmitting them together with the tag ID. Already cooperating with companies focused in solar street lighting, ambient conditioning, energy saving, building security, GPS location and people health control, Farsens is looking for more partners to expand the adoption of its technology to further innovative applications. . The Farsens Gen 2 battery-less RFID sensor tags feature a PCB substrate and are based on the proprietary FS-UHFPIC01 RFID chip which is able to power an external commercial sensor and communicate with it without the need of a battery. Three basic versions, one with accelerometer, another one with temperature sensor and a third one with pressure sensor are presented below. Other versions with different sensors can be provided depending on customer needs.. The FS-111A is a Gen 2 passive RFID tag which returns its 96-bits EPC and its instant 3-axis acceleration when interrogated by the reader. The product measure 130 x 32 x 0.8 mm and is available with two accelerometer options: the ST Microelectronics LIS3DH or the ST Microelectronics LIS331DLH.. The FS-111P is designed to measure the instant pressure and transmit it together with the tag EPC number, when interrogated by the reader. 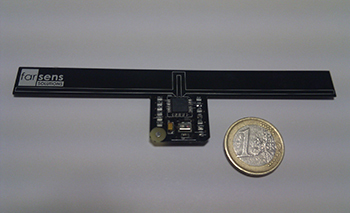 This Gen 2 battery-less RFID sensor tag features the Freescale MPL115A1 Miniature SPI Digital Barometer. The sizes are the same as the FS-111A. The FS-111T comes with a proprietary temperature sensor for instant temperature reading. The FS-111T measures 130 x 41 x 0.8 mm. The above products can be delivered with application-targeted encasements in order to meet specific requirements in terms of durability and fixing method. 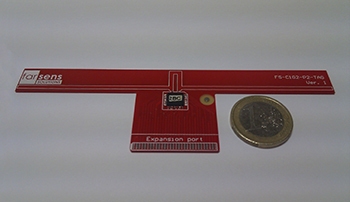 For more details on the these passive RFID sensors, please contact Farsens or login to the VeryFields Database. This entry was posted in RFID News, RFID tags and tagged Farsens. Bookmark the permalink.